One of the first concerns of a money conscious bride is the wedding photography cost. As such, in this article we will analyze photographers' expenses. Besides, we will assess the impact of wedding photography cost cutting measures. Before we start, if you are looking for our prices please visit our affordable prices and packages page. As per the WeddingBells annual surveys, the average cost of a wedding in Toronto is around $30,000. Most wedding photographers charge 10-15% of that. 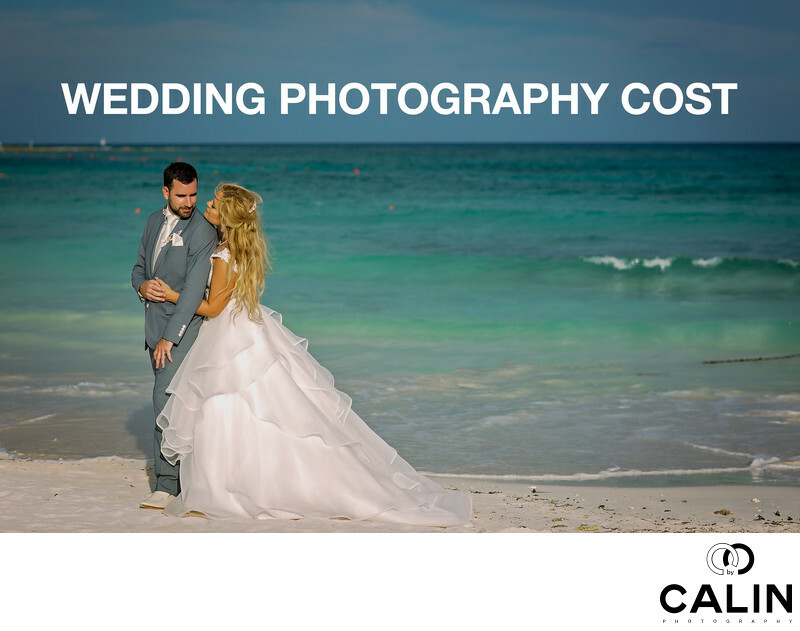 As such, the average wedding photography cost in Toronto is between $3,000 and $4500. Unfortunately, photographers have to charge those prices to stay in business. As you will show, photographers incur high overhead costs and high direct costs. First, we will analyze the overhead expenses of a wedding package. Those incur anyway, even if we don't photograph any wedding. Among them we have office, marketing, equipment, professional services and labor costs. A major cost, Rent in Toronto is at least $500/month. Besides, photographers pay utility bills every month. Also, phone services will set back a photographer $80/month. Besides, the internet costs $80 per month while website hosting adds another $30 /month. Unfortunately, marketing and advertising costs are too high for many Toronto wedding photographers. With the low Canadian dollar, US advertising is now even more expensive. Also, marketing and labour account for over 70% of the wedding photography costs. They are unavoidable for a small business. As a result, photographers have to pass costs to their clients. A major source of leads is Google Adwords, which is not cheap. For example, when a bride clicks on one my ads, that costs me $3.95/click. As such, to reduce my advertising costs and offer you competitive prices, I always ask you how you heard about me. Facebook started as a free channel, but is becoming more expensive every day. Blogs and directories also charge to list my business in their vendor directory. In the last 12 months that alone cost me $3,600. Although Bridal Shows a good marketing channel, they are expensive. For example, a simple booth at a Bridal Show in Toronto costs north of $2,500. When you ad the cost of albums, large prints, flyers, décor, the figure comes closer to $5,000. Also, the shows occur on weekends so as photographers we forgo any revenue that weekend. Is it worth the money? Sometimes yes, often there is no return on the money invested in a bridal show. A long time ago I decided that print advertising is not for me. First, it is THE most expensive medium after TV (tens of thousands for the back cover). Second, it is almost impossible to calculate the ROI (return on investment), it has no SEO value and others. More important, in this digital era, readership of magazines is low. Joining professional wedding photographer's associations has many benefits. It keeps the photographer in touch with the latest photography techniques. Also, it pushes the photographer to improve his work through periodic competitions. Finally, professional associations are strong communities. That helps if the photographer is sick and can not photograph a wedding. She can call someone who is available to photograph the wedding instead. The membership fees add up to $360/year in my case. Important to note, to photograph your wedding, I will be bringing equipment valued at $30,000+. That depreciates over time and I need to amortize it at a rate of $550/month. Would I shoot a wedding using old equipment? NO! I don’t want to be the photographer lost a couple’s wedding photos because the cheap old camera died. Photography workshops are prohibitive. For instance, attending 2-3 workshops per year costs $4,800. If I don't learn new techniques, your wedding pictures won't look good. Besides, I need to pay insurance, an accountant to do my taxes and a lawyer who reviews the agreements I sign. I have to pay myself a salary and to survive in Toronto, a $50,000 gross salary is the least amount required to survive. Here is a table consolidating the above mentioned overhead expenditures. Besides the overhead expenses, a wedding photographer incurs direct costs. Cost with a second shooter - $500/wedding. The direct costs per wedding add up to $900. When a photographer shoots 40 weddings a year, that adds another $36,000 annually in direct costs. Let’s summarize our findings. To break even, a Toronto wedding photographer has to generate a $126,080 in revenue. I am shocked that some photographers charge less than $2000 per wedding. By analyzing the cost structure above, was curios how that can be done and what it implies. Let's analyze a low cost wedding photographer. Accountant Cut Does not function as a business. Lawyer Cut Not a legal entity. Gross Salary Cut Part time occupation, if main job does not allow it, photographer will cancel last minute. The table above tells us a clear story! When you hire a low cost photographer, you are taking risks. Embrace yourself for low quality images, old equipment which can fail. Many of your photographs will be out of focus, underexposed, blurred. Also, the cheap photographer will not edit your images. It is not uncommon for old hard drives to crash, so you will never see your wedding pictures. The budget photographer does not operate a legitimate business and photography is only a secondary source of income. When his main job does not allow him to photograph your wedding, your photographer will cancel on you. His second shooter often never shot a wedding and the car he drives is unreliable. A part time photographer can not shoot more than 20 weddings a year. Even that is too much and he will be burnt out. You definitely don't want him shooting your Big Day. Direct wedding photography costs are those associated in mod direct with shooting a wedding. A cheap wedding photographer incurs a total of $15,800 in costs. Direct costs are $2,000 and overhead costs equal $13,800. Even though a low cost photographer can offer very good deal, you are taking high risks sacrificing quality. The wedding photography cost in Toronto is high for a reason. In photography, everything is expensive. By hiring a bargain based photographer, you are gambling your wedding pictures. Is it worth taking that risk? You are the only person who can answer to that question. I wish you best of luck in finding the best wedding photographer for you. If you feel this article was worth reading, please share it with your friends. That will allow me to cut my advertising expenses and pass the savings to you or other couples.